NOTICE: Tote Ireland are no longer accepting referrals and consequently we can no longer recommend them for betting online. 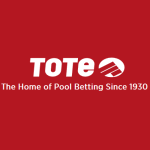 If you are interested in Tote betting try Totesport, the British online version of the Tote, or Betfred, part owners of the Tote. The Tote Ireland is very much the same as the Tote we know in the UK. 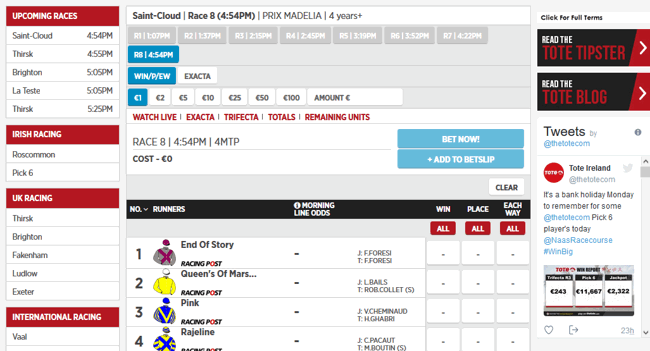 This is the online website of the Irish Tote owned by Horse Racing Ireland. Just like our version all bets placed go into a pool with the winners receiving a share of the dividend proportional to their stake. The Tote take a small commission from the pool and the rest is shared out. All profits go back into Irish horseracing – just as our Tote used to do before it was privatised and sold to Betfred. Tote betting isn’t for everyone but if you do like it then this is now one of your best options for betting on UK, Irish and worldwide horse and greyhound racing. Especially as the UK tote is now basically ruined since being sold off. The tote often pays better returns than you get from conventional fixed odds bookies, offers more horse racing betting opportunities and offers unparalleled jackpot opportunities. The site being Irish is conducted in Euros but you can deposit and withdraw in British Pounds at market exchange rate with no fees levied. The tote is a syndicate betting system where instead of the bookie setting an odds price and taking your bet instead the odds are defined by the number of people who bet and what they bet on. Here you are betting against each other, peer to peer (known as parimutuel betting), with the operator taking a small cut and this makes the prices more reflective of actual opinion. The winning payout is then the amount in the pool divided by the amount staked. Let’s say you’ve placed a win bet on a horse in a race and staked €2 and it wins. There total pool made up of all bets placed on the race (minus commission) is say €3000 and €150 has been staked in total on the winner. Your payout will be 3000/150 x 2 = €40, the reflective odds would be 19/1 (20.0). There are many types of tote bet from the basic win or each way bet to betting on places, exact finishing order (same idea as a forecast or tricast), finish in any order (same idea as a reverse forecast or tricast) and others. The real attraction (for me anyway) are the multiple bets. The jackpot for example requires you to pick the winner in 6 races at a selected meeting, a difficult job, but with payouts often €100,000’s it certainly pays off if it does win. Scoop6 is an even bigger jackpot run on select race days combining races from several meetings, winning this can often get you seven figures back. You can also predict horses to place in all 6 races (placepot) or 4 selected races (quadpot), which is a little easier to do and still pays out good returns, especially if some outsiders win for you. All in all I find Tote betting more fun than standard fixed odds. With the multiples you can get a lot back off low stakes, I tend to treat these as ‘extra bets’ that I don’t think will win but if they do it will be amazing. Even if you just back standard win or each-way lines you will very often get better prices through Tote than fixed odds anyway. In many ways it is hard to think of a reason not to bet using the tote. The fact the Tote take a commission from all bets also means there is no conflict of interest here, they don’t care who wins and this means a fairer level playing field for punters. The basic principle is the fewer people in the pool that back the same thing you do the more you will win if it comes in, therefore a ‘favourite’ or ‘outsider’ here is based on the opinion of everyone betting, not on the opinion of some odds trader. The Tote Ireland covers all UK and Irish horse and greyhound racing so do not worry that they are not a British site, you can bet on every meeting through them. In actual fact if you like betting on racing abroad then this is a superb option too with racing and pool betting from all over the world. As the site is focused on what it does too there is no clutter here, so if racing is your main thing you will likely enjoy the lack of other sports and thing like casinos getting in the way. 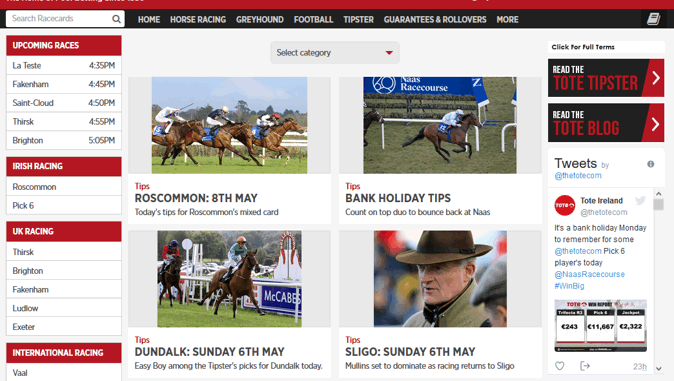 There are added features such as a blog, tipster section and fixtures and results. As this is run by actual racing professionals these areas are better than any fixed odds bookie will offer, so if you like to study your bets and read about form this is one of your best options. If you like betting on football too then don’t worry there is pool betting available for that too, known as colossus. You can bet on other peoples syndicates or create your own, these can be made up of various number of picks on different markets such as match result, both teams to score, over/under, correct score, etc. Entry cost to the syndicates vary depending on the amount being played for, ranging from just €0.50 up to €100’s. If you like other peoples syndicates you can follow them on site or social media or become your own captain and make your own. Once the syndicate is funded it is locked. The Irish Tote was established at a similar time to the UK version in 1929. The idea behind it is back then betting was largely illegal except at racecourses and tracks and this led to a lot of unscrupulous agents taking bets. The governments took note of this, and the fact there was no revenue was being collected by the treasury, and established the Totalisator board. The tote first offered win and place betting at Fairytown in 1930 and by the end of the decade had grown 20 fold. The fact the tote is still owned by Irish racing makes them a real draw over the British version, and frankly is one reason we are listing them here. In recent decades since the advent of online bookmaking tote and totepool betting has fallen out of popularity. This is quite strange really considering the added value you can get vs fixed odds betting, and is largely caused by the fact that betting sites have huge advertising power, enticing offers and better looking websites. 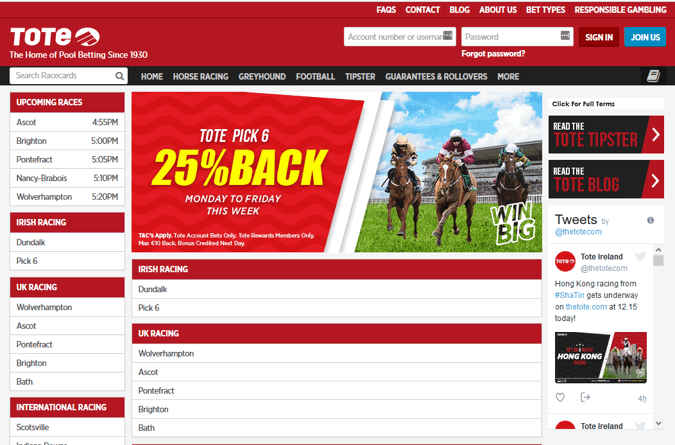 Fine the tote website looks budget but it is just as functional as any other bookies websites, in fact the no frills experience makes it easier to navigate and quicker to load any way. If you love racing and your main objective from betting is to get the best value and honest prices then avoid the flashy graphics offered by betting sites and get a Tote account instead. 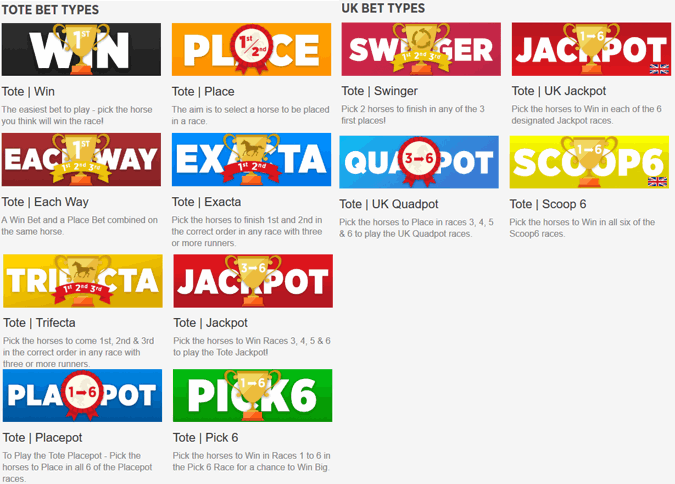 The UK tote still has a website called Totesport, it also offers pool betting in the UK and Ireland but is now owned by Betfred and is basically just a clone of it’s parent.